Combine all ingredients in a vitamix blender (or food processor). Blend until smooth. In a vitamx or high speed blender, combine almonds, red peppers, lemon juice and a pinch of salt. Blend until mixture is smooth and almonds are completely pulsed. Taste mixture and add more salt and lemon if necessary. De-leaf your kale form the stems (http://www.youtube.com/watch?v=rPGWMbdKtoI). In a large bowl, combine kale leaves and almond paste. 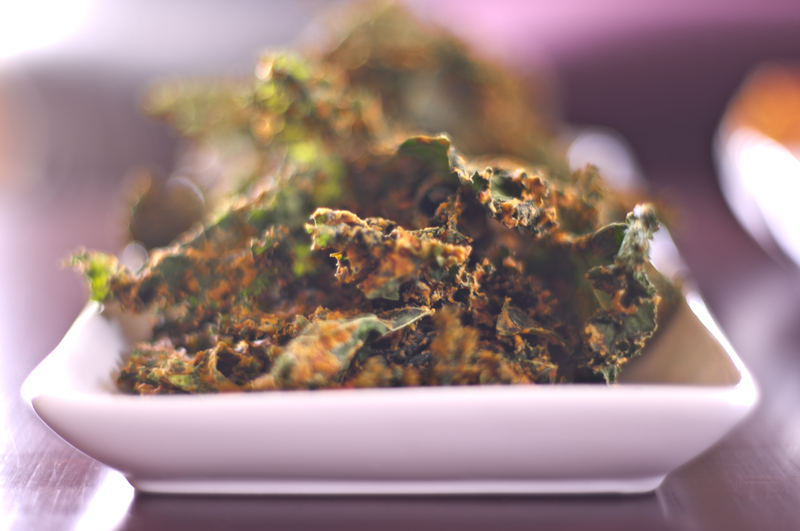 Rub the kale with the almond paste and place kale leafs onto a dehydrator tray. Once all leafs have been placed onto dehydrator trays, pop them into your dehydrator and set the machine to 115 fahrenheit for 10-12 hours. Chips are done when they are crunchy not moist. In a vitamx or high speed blender, combine tomatoes, red peppers, flax seed and a pinch of salt. Blend until mixture is smooth.Taste mixture and add more salt and lemon if necessary. The mixture will be fairly watery. Pop them into your dehydrator and set the machine to 115 fahrenheit for 10-12 hours. 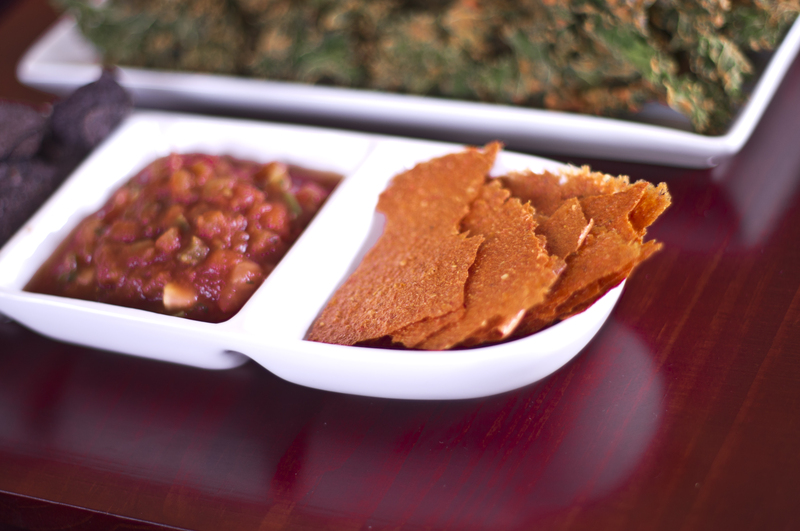 Remove mixture from paraflexx sheets after 10-12 hours and re insert into dehydrator for an additional 4-5 hours. Chips are done when they are crunchy not moist. In a high speed blender or food processor, combine all ingredients and blend until smooth. 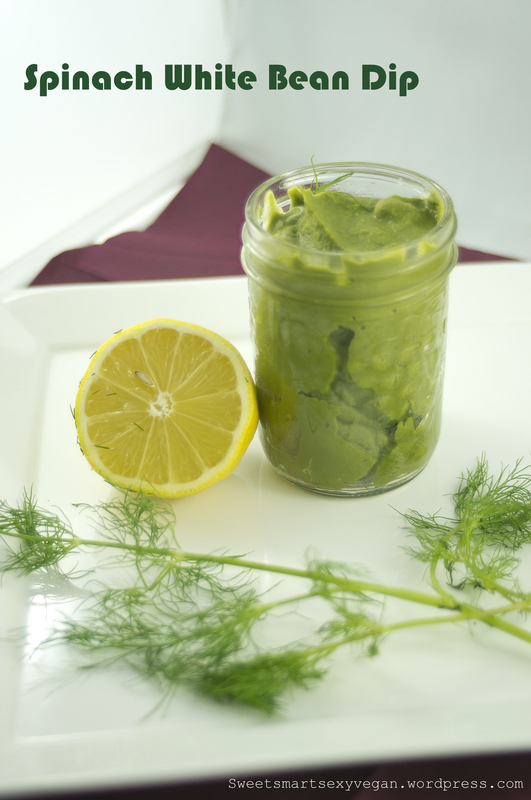 Taste and add more lemon, dill or salt to your liking. In a large pot, bring 4-5 liters of water to a boil. Pour butternut squash into pot and cook on medium heat till tender (15-20 minutes). Remove from heat, strain and set aside. In a large frying pan, heat oil on medium high heat. Add garlic, ginger, onion and jalapeno peppers. Cook till onion has turned brown. In a large pot, transfer garlic mixture, butternut squash, coconut milk, tomatoes (with juice) and beans. Bring to a boil then simmer for 10 minutes. Remove from heat and serve on top of cooked quinoa. Garnish with sliced green onions. In a small pot, bring water to a boil. Add buckwheat groats and cook for 10 minutes. Remove from heat, cover for 20 minutes or until liquid has been absorbed by the buckwheat. In a blender, combine all cheese ingredients until fine. Set aside. In a high speed blender, blend all pizza sauce ingredients until smooth. Set aside. Cut zucchini into thin strips. 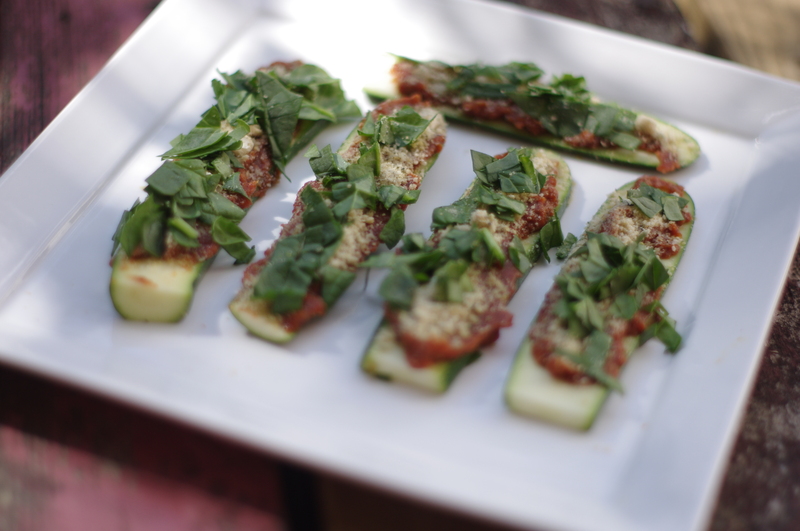 Top zucchini slices with pizza sauce, then sprinkle cheese, then sprinkle spinach. Repeat for all zucchini strips. For a video of this recipe go to the link: http://meganelizabeth.com/ns/media/videos/. Prepare brown rice as directed by box. Cut up vegetables and tofu into 1 inch x 1 inch pieces. In a wok, toss in tofu and let cook until crispy. 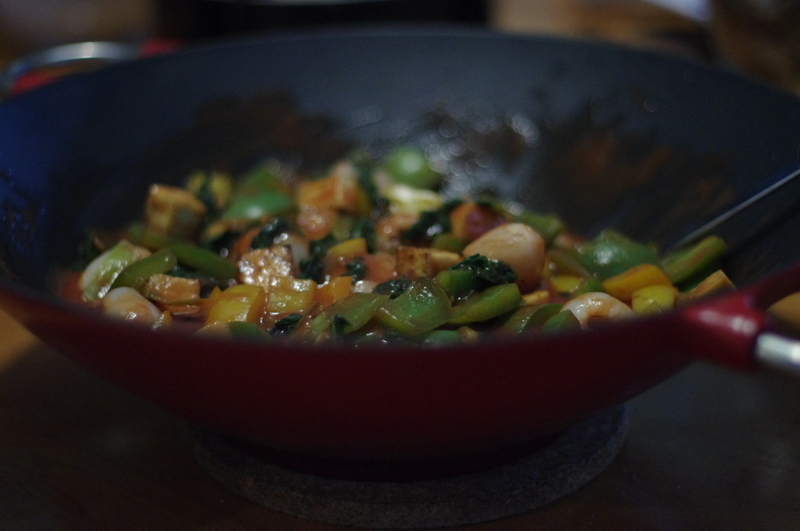 Once done add vegetables into wok and cook till slightly chewy. In a large mixing bowl, combine the lychee juice from the can, tomato paste, white vinegar and salt. Add sauce and lychee fruit to the wok and simmer. In a glass, combine corn starch with 4 tbsp of COLD water. Add to the wok mixture. This should thicken the sauce. Prepare vegetables as indicated above. Add vegetable broth, bay leaves and caraway to the pot and let simmer for 20 minutes. Stir in fresh dill and vinegar. Simmer for an additional 10 minutes. Remove bay leaves.Transfer soup to a blender and puree. Return back to pot for an additional 5 minutes of heating. 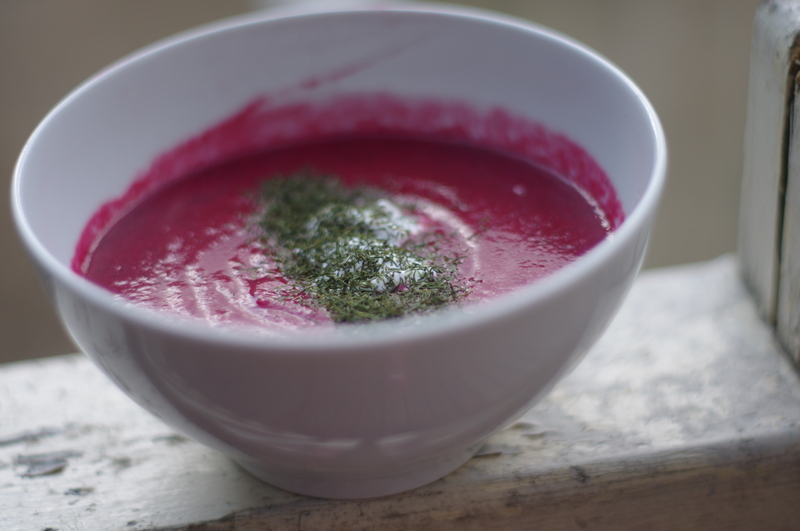 Serve with a dollop of sour cream and more fresh dill. In a large pot, heat butter or oil on medium-high. Add onions, garlic and potato and saute for 5 minutes. Add in cut corn kernels and jalapeno and saute for an additional 5 minutes. Add vegetable broth to the pot; turn heat to medium and simmer for 10 minutes. Transfer mixture to a blender or food processor and blend on low till soup is in between chunky and pureed. Return mixture back to pot. On low heat stir in soy milk with pureed soup. Heat for 5 minutes. Adjust flavor to your liking with salt and pepper. Serve in bowls, garnished with tomato and basil. Cut baguette into 12 slices. Butter each slice and top with minced garlic. Turn oven on to Low Broil. Place baguette slices onto a baking sheet. Put in oven and cook till golden brown (5-10 minutes depending on oven). Steam your fresh spinach in a pot of boiling water for 5 minutes. Once done, drain and cover with cold water. 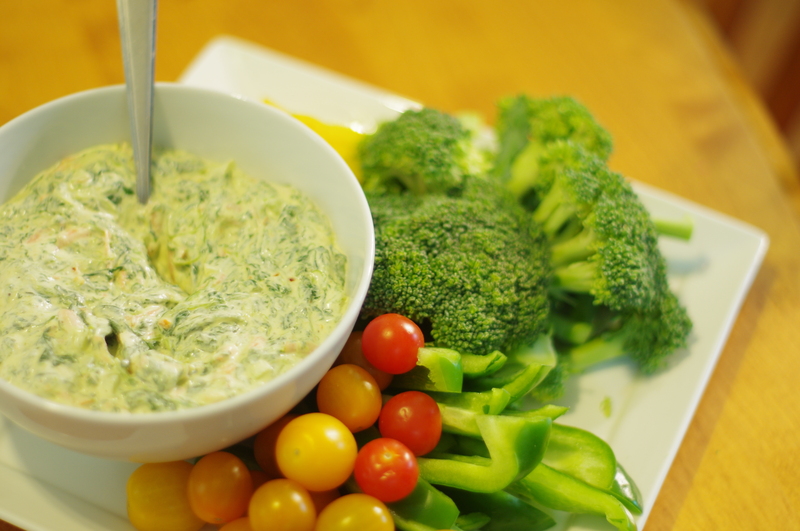 Cup up any vegetables you would like to dip in this dip while waiting for your spinach to cool. Alternatively you can us frozen spinach and simply thaw it before making this recipe. Once spinach has cooled, squeeze as much water as you can out of the leaves. The spinach should become mushy, this is good. Combine spinach and all other ingredients in a mixing bowl. Chill in refrigerator for 2 hours before serving. This recipe goes great with toasted french bread, homemade bread, bagels or fresh chopped vegetables. Pre-heat oven to 400F. Line a baking sheet with parchment paper. Place puff pastry on top of parchment paper. To make the bean dip, combine all ingredients into blender and blend until smooth and thick. Spread dip over puff pastry while leaving 1 inch of puff pastry exposed. This room will allow the edges of the tart to puff and become crunchy when cooked. 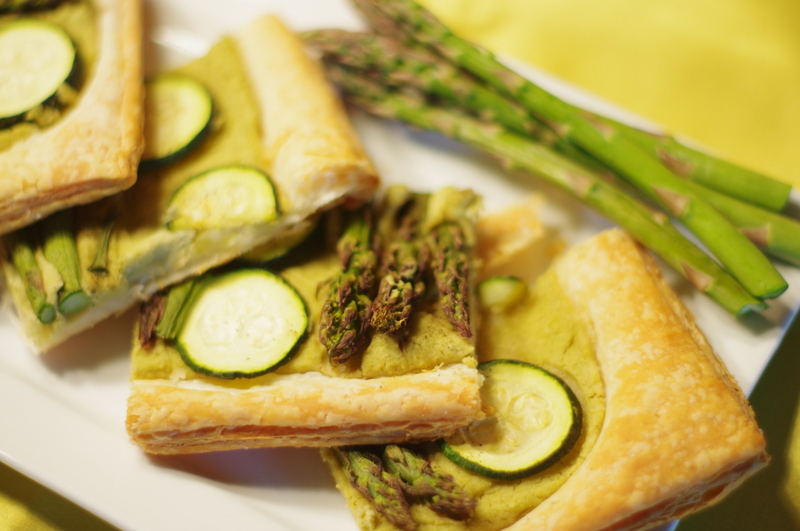 After spreading dip, arrange asparagus and zucchini on top of dip much like the patter shown in the photos below. Cook pastry for 20 minutes or until edges are golden brown. 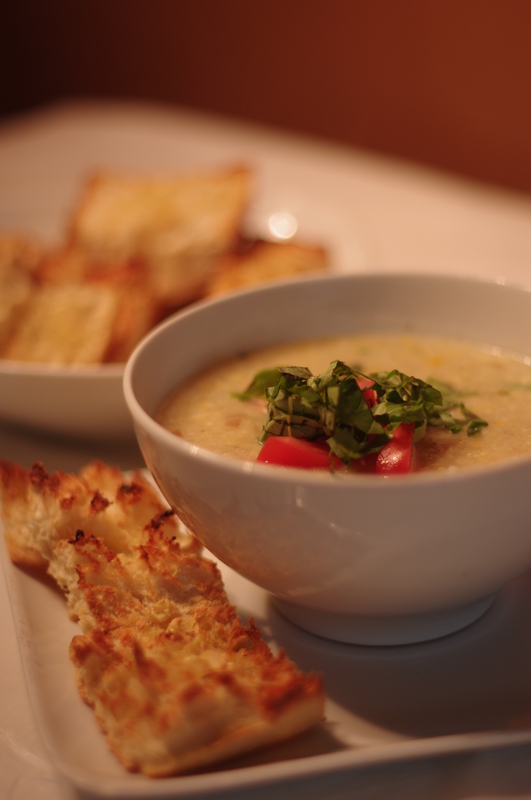 Serve as an appetizer or meal with a salad on the side. Boil your vegetable broth in a large pot. Add quinoa and turn down to medium heat. 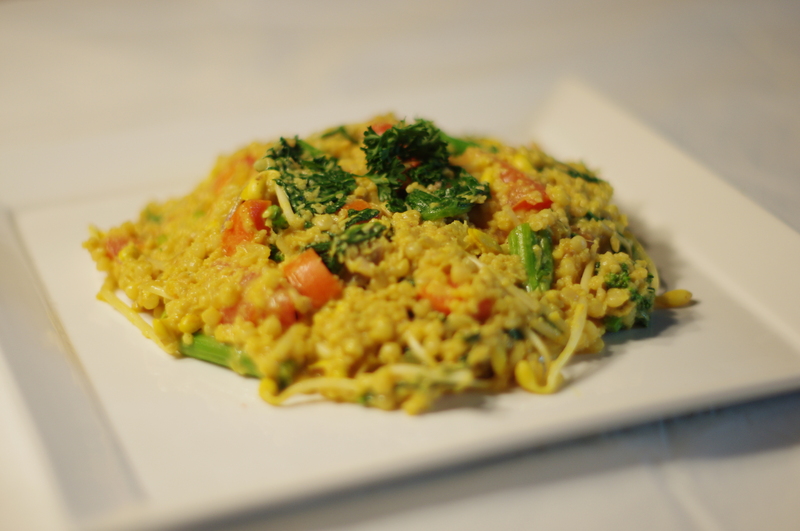 Cook until quinoa is fluffy and soft. Prepare all vegetable as directed above. Pour into a big mixing bowl. Add ground flax, ground sesame seeds, BBQ sauce, breadcrumbs. In a high speed blender or food processor, blend chickpeas until smooth. You may need to add a little water. You want this mixture to have the same consistency as hummus. Add the chickpeas to your vegetable mixture when done. 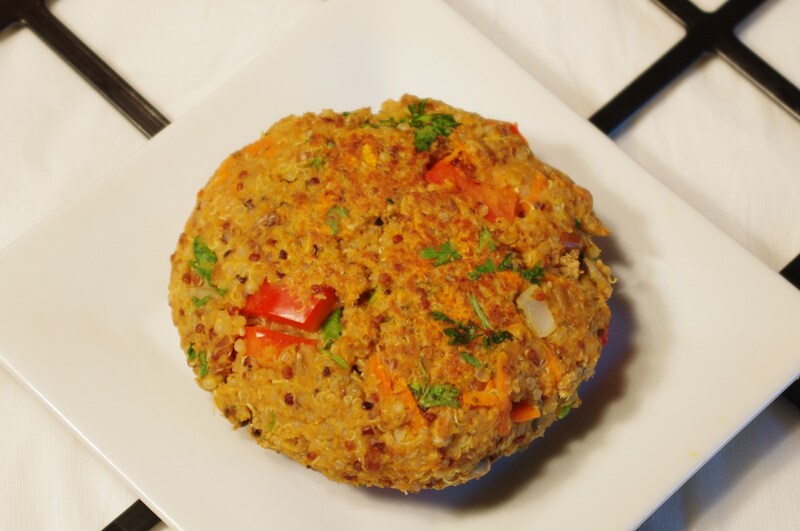 Combine all remaining ingredients including roasted sunflower seeds and quinoa to vegetable-chickpea mixture. If mixture is not sticking together, add more bread crumbs if too sticky or some water if too dry. Form mixture into 1 cup patties. Heat some oil (or spray pam) in a large frying pan. Add burger patties. Cook for 5 minutes on medium- high heat then flip and cook on other side for an additional 5 minutes. Depending on how big your frying pan is, you may need to do several batches of burgers. Serve as is or with a whole wheat bun, lettuce, tomatoes, vegannaise, ketchup, etc. Prepare israeli couscous by boiling water and vegetable broth cubes. Add israeli couscous and simmer until the couscous is chewy and no longer firm. Chop all your vegetables and get them ready to be cooked. In a large wok or frying pan, heat on medium-high some oil of your choice (grapeseed or olive oil works best). Add you garlic, ginger, and onions to the hot oil. Stir for 4 mins. Add your carrots to the mixture. Cook for another 4 minutes. Add spinach, celery and tomatoes. Turn heat to medium and cook for 5 minutes. Add your nut milk, coconut, nutritional yeast, curry powder and turmeric to the vegetable mixture. Heat for 10 minutes or until carrots become slightly soft. Drain israli couscous if there is excess liquid. Pour into vegetable mixture and combine. Add your bean sprounts now and let mixture cook on medium heat for another 5 minutes. Add lemon juice, mix, taste, add salt if needed. Serve hot. Toss dressing in with salad ingredients. 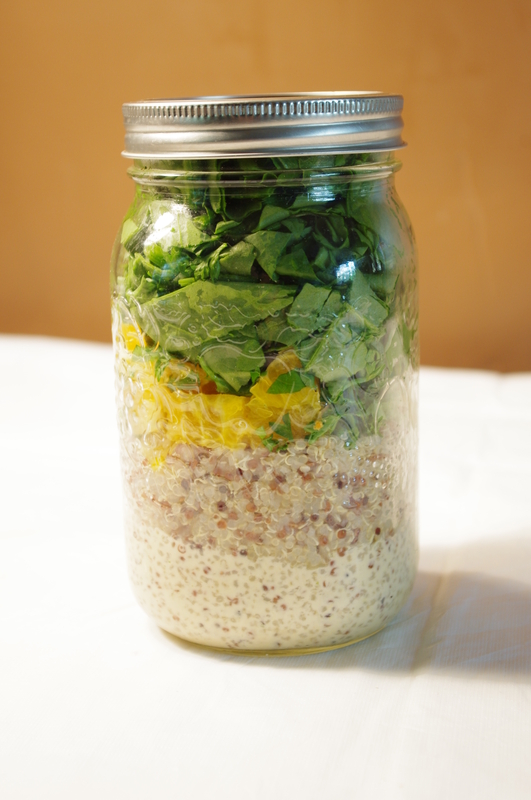 Salad- Using a 1L Maison jar, pour your dressing into the bottom of the jar. Pour your quinoa on top of the dressing. Next place your chopped orange slices. Finally pour in your herbs and spinach. Close with Maison jar lid. When ready to eat, pour jars contents into a big bowl, toss then eat. * I have yet to experiment to see how long these salads last for in the fridge, the blog I got this idea from says up to 4 days. 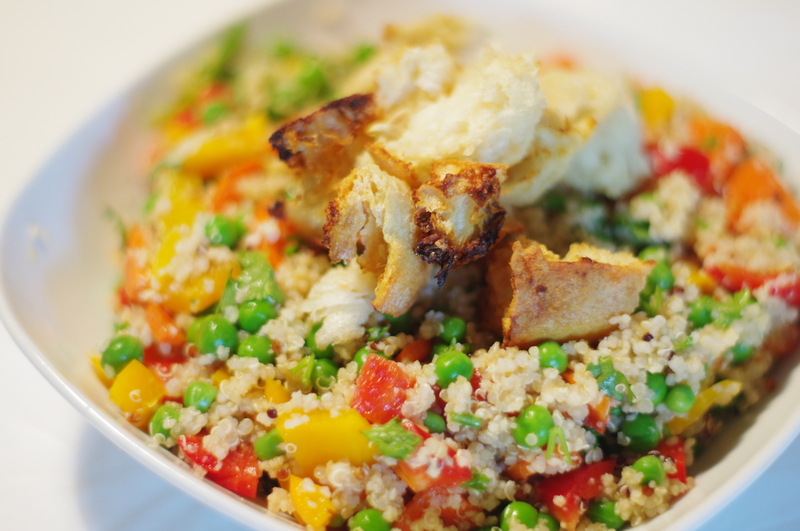 For the salad, cook your quinoa and couscous while chopping up vegetables. Once cooked, allow for grains to cool (15-20 minutes). Once cooled, place all salad ingredients in a large mixing bowl. 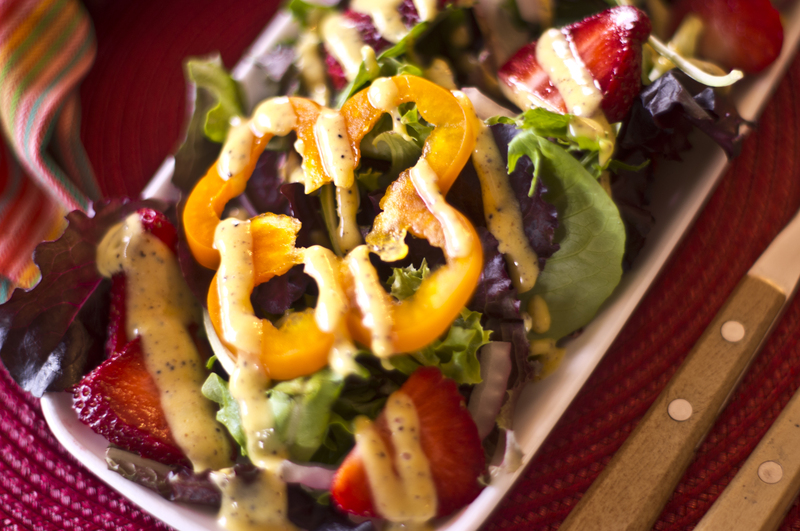 To make the dressing, place all ingredients except for the apple cider vinegar and salt in a juicer. Add apple cider vinegar and salt to juiced mixture. 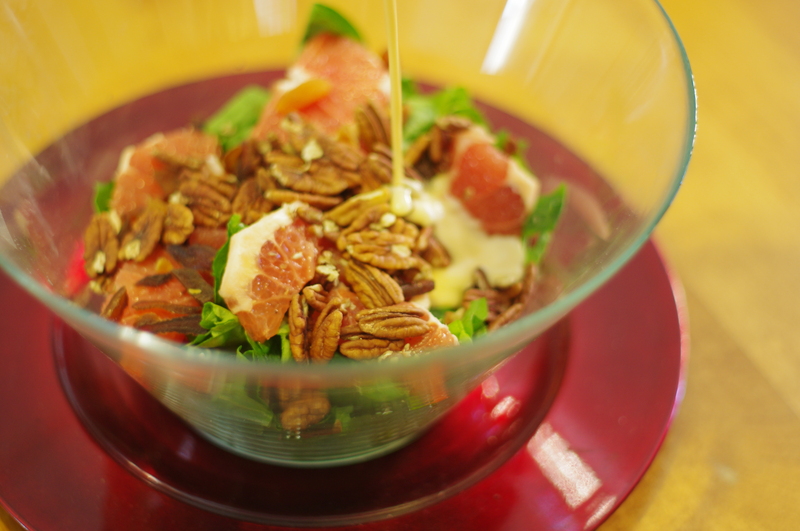 Combine and drizzle on top of salad ingredients.